La Fraise: sponge pain de gene, gelée strawberry, chantilly coconut, croustillant red, juice raspberry, gelée raspberry, sorbet strawberry, strawberries. 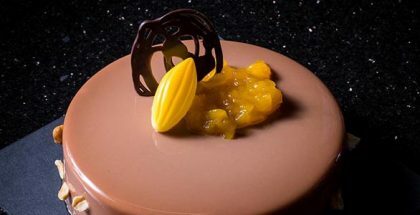 “In China, people eat fruit like crazy,” said Frederic Moreau, French executive pastry chef at The Peninsula Hotel Beijing, to our correspondent Santiago Corral at the meeting they held a few weeks ago. And fruit, specifically strawberry and raspberry, is the main element of one of his desserts, La Fraise, ideal for eating in hot weather and seducing with its color and refreshing character. Raspberry and strawberry are fruit with a sweet and slightly acid flavor that have many antioxidant properties. 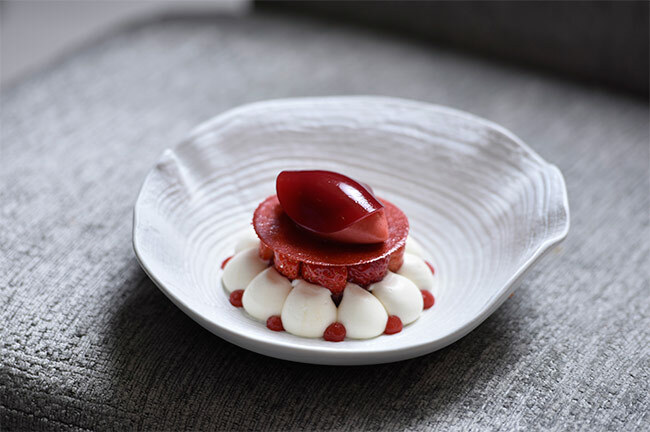 In this piece they are presented in different forms (gelee, juice, sorbet) and with a clear link to French pastry culture in its very name, La Fraise. 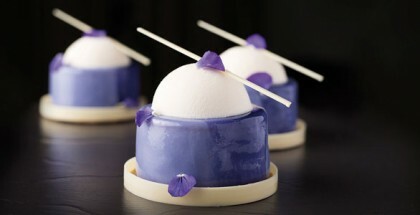 In his final presentation, Frederic Moreau accompanies it with coconut chantilly. With paddle mix paste with warmed eggs. Once soft enough switch with whisk, whip until fluffy. Fold fats and sifted flour-baking powder. Scale 1200 g in 40 x 60 cm frame. Bake at 150ºC for 25 minutes. Cut out circles of 7 cm. Warm up to 50ºC puree, sugar, algin and xanthan. Robot coupe add second puree. When cold robot coupe again, place in piping bag, freeze. Bring cream, glucose to a boil, add chocolate. Add puree, burr mix. Keep in cooler. Cook fondant and glucose to 150ºC. Add melted chocolate, pour over paper. Once cool down robot coupe and ground spice it to obtain a thin powder sift over silpat with a round cutter imprint the powder. Bake at 180ºC until lightly melted when cool remove with a small spatula. Place in a airtight container. Place in a bowl 1000 g frozen raspberries, cover with plastic film, place bowl over boiling water for 2 hours, until juice is out. Do not mix, strain berries in cheese cloth overnight in fridge, next day place juice in squizze bottle for soaking sponge and also to make raspberry gelee. Bring juice, sugar, agar to a boil, add gelatinm pour on acetate sheet as thin as possible. Cut out circles of 6 cm. Keep in fridge. With 2 cm thick plexiglass trim strawberries so they are at the same level. Brush raspberry juice over pain de gene, place in middle of the plate, with large round tip pipe coconut chantilly around the edge of the sponge, pipe strawberry gelÉe between chantilly and in the middle of sponge. Add strawberries in a circle, pipe coconut chantilly in the middle. Place red croustillant, quenelle of sorbet, add disc of raspberry gelée.